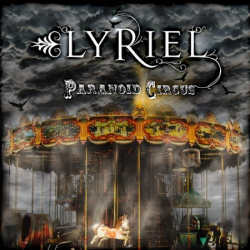 Lyriel is a German folk metal band that was founded in 2003. Releases followed in 2005 and 2006 before the band slowed down. An unlucky change of label resulted in a third album that went by rather unnoticed. Now they are back on AFM Records who decided to re-release the last album which came out not even two years ago. The fifteen tracks are supplemented by two remixes: an orchestral version of the title track and an electronic version of The Regret that has turned out to be quite danceable. The new cover artwork also looks more professional that the original one. The band describes their style as dark romantic celtic rock, which means that you will find traditional as well as heavier sounds. One has to admit that Lyriel put a lot of emphasis on variety. The septet won’t get a prize for originality, as comparisons to Leaves Eyes and Midnattsol are hard to deny, but their songwriting is very evolved and doesn’t need to hide behind the aforementioned influences. The album starts with a short spoken intro where they had the chance to hire the German dub voices of Heath Ledger and Matt Damon. This is followed by upbeat sounds, as the majority of the tracks are quite fast and melodic. They never sound really extreme, but they also avoid the kitsch trap. The songs are very accessible and powerful so that you will be immediately immersed in the music. Jessica Thierjung has a very pleasant voice that you won’t tire listening to. The folk elements never sound like a mere gadget. The fact that they are combined with dramatic and mystic moods enhances them considerably. I only lament the high number of ballads, especially towards the end of the record. This diminishes a little the listening experience. Nevertheless Paranoid Circus is an excellent album, even if there are a couple of blemishes. The band and the album absolutely deserved this second chance. Everyone comfortable with symphonic and folk metal will get their money’s worth here. This is a circus that one should definitely not boycott.